The Prince of Wales is to launch an initiative to encourage young people to do more work in the community in a bid to tackle gang violence. Writing in the Mail on Sunday, he said street murders were the "extreme result of too many young people no longer guided through a rite of passage". 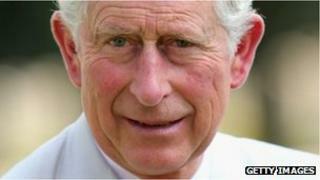 Prince Charles said he was inspired to act by meeting the parents of children who had been violently killed. The campaign is being supported by the three main political party leaders. The prince will launch the Step Up 2 Serve initiative at Buckingham Palace this week. He will be joined by Prime Minister David Cameron, Deputy Prime Minister Nick Clegg and opposition leader Ed Miliband, plus 50 young people, to start a pledge campaign called #iwill. Prince Charles said: "After listening to families whose children have been murdered through street violence, I found it impossible to ignore their pleas for help in finding solutions to a problem which has blighted too many lives. "I often reflect on the bravery and courage shown by Barry and Margaret Mizen, whose teenage son Jimmy was murdered in 2008. "The Mizens are convinced - as I have been for the past 40 years - that part of the solution is in providing more structured activities for young people." The prince added: "In my opinion, tragedies such as the murder of Barry and Margaret's son are the extreme result of too many young people no longer guided through a rite of passage; young people who would benefit from the guidance and help of organisations such as the Guides, Scouts, cadets and other youth organisations." The prince said that at present fewer than three in 10 young people volunteered regularly - the campaign proposes that this should rise to half of all those aged between 10 and 20 by 2020. Charles said: "I believe that such a long-term campaign, which is supported by all sectors of society and involving faith and political leaders, education, business, trade unions and the voluntary sector, has a unifying vision. "That vision is that all of us, from all walks of life, will 'step up' and pledge, at #iwill, to help young people take every opportunity to be of service to others."